New worldviews require new ways of thinking, sciencing, languaging, and practicing. It is important to note that the nursing process practice method is not consistent with the assumptions and beliefs articulated in Rogerian nursing science (Butcher, 20014; Butcher and Malinski, 2015). The nursing process is a stepwise sequential process inconsistent with this nonlinear or acausal view of reality. In early writings, Rogers (1970) did refer to nursing process and nursing diagnosis, however in later years, Rogers asserted that nursing diagnoses were not consistent with her scientific system. Rogers (quoted in Smith, 1988) stated: “Nursing diagnosis is a static term that is quite inappropriate for a dynamic system . . . it [nursing diagnosis] is an outdated part of an old world view, and I think by the turn of the century, there is going to be new ways of organizing knowledge” (p. 83). within a unitary context, nursing diagnoses are normative, particularistic, and reductionist labels describing cause-and-effect (i.e., “related-to”) relationships inconsistent with the view of a person as an irreducible whole more than and different from the sum of parts in mutual process with the environment. Nursing diagnoses are viewed a value judgments based on societal norms about what is considered healthy and what is a deviation from health. Within the simultaneity paradigm, health is a value that reflects the choices that each person makes. In addition, the term intervention is not consistent with practice within a unitary perspective. Intervention means to “come, appear, or lie between two things” (American Heritage Dictionary, 2000, p. 916). From a unitary perspective, persons and their environment are integral and in a mutually simultaneous process. This, when everything is integral, the can be no “in-between” since human and environmental fields are inseparable. The nurse and the patient are inseparable and interconnected. The idea of outcomes infers predictability. Therefore, outcomes are inconsistent with the unitary notion that the universe is characterized by unpredictability (Butcher, 1997). When asked Martha Rogers would often say that it is up to Rogerian nurse scholars to develop practice methods that were consistent with the postulates and principles of the Science of Unitary Human Beings. In her 1970 book, Rogers wrote the “practice encompasses the art of nursing and is the utilization of nursing’s abstract body of knowledge in the service of man” (p, 121). Barrett’s two-phase Rogerian practice methodology for health patterning is the accepted alternative to the nursing process for Rogerian practice and is currently the most widely used Rogerian practice model. Barrett’s (1988) practice model was derived from the Science of Unitary Human Beings and consisted of two phases: pattern manifestation appraisal and deliberative mutual patterning. Barrett (1998) expanded and updated the methodology by refining each of the phases, now more appropriately referred to as “processes.” Each of the processes have also been renamed for greater clarity and precision. Pattern manifestation knowing is the continuous process of apprehending the human and environmental field (Barrett, 1998). “Appraisal” means to estimate an amount or to judge the value of something, negating the egalitarian position of the nurse, whereas “knowing” means to recognize the nature, achieve an understanding, or become familiar or acquainted with something. Voluntary mutual patterning is the continuous process whereby the nurse assists clients in freely choosing—with awareness—ways to participate in their well-being (Barrett, 1998). The change to the term “voluntary” emphasizes freedom, spontaneity, and choice of action. The nurse does not invest in changing the client in a particular direction, but rather facilitates and mutually explores with the client options and choices, and provides information and resources so the client can make informed decisions regarding his or her health and well-being. Thus, clients feel free to choose with awareness how they want to participate in their own change process. The two processes are continuous and nonlinear, and therefore not necessarily sequential. Patterning is continuous and occurs simultaneously with knowing. Control and predictability are not consistent with Rogers’ postulate of pandimensionality and principles of integrality and helicy. Rather, acausality allows for freedom of choice, and means outcomes are unpredictable. The goal of voluntary mutual patterning is the actualization of potentialities for well-being through knowing participation in change. Cowling (1990) expanded Barrett’s original practice methodology by proposing a template comprising ten constituents for the development of Rogerian practice models consistent with the postulates and principles of Rogerian science. Cowling (1993b, 1997) refined the template and proposed that “pattern appreciation” was a method for unitary knowing in both Rogerian nursing research and practice. Cowling preferred the term “appreciation” rather than “assessment” or “appraisal” because appraisal is associated with evaluation. Appreciation has broader meaning, which includes “being full aware or sensitive to or realizing; being thankful or grateful for; and enjoying or understanding critically or emotionally” (Cowling, 1997, p. 130). Pattern appreciation is approached with gratefulness, enjoyment, and understanding and reaches for the essence of pattern. Pattern appreciation has a potential for deeper understanding. The first constituent for unitary pattern appreciation identifies the human energy field emerging from the human/environment mutual process as the basic referent. Pattern manifestations emerging from the human/environment mutual process are the focus of nursing care. Next, the person’s experiences, perceptions, and expressions are unitary manifestations of pattern and provide a focus for pattern appreciation. Third, “pattern appreciation requires an inclusive perspective of what counts as pattern information (energetic manifestations)” (Cowling, 1993b, p. 202). Thus, any information gathered from and about the client, family, or community, including sensory information, feelings, thoughts, values, in¬tro¬spective insights, intuitive apprehensions, lab values, and physiological measures, are viewed as “energetic manifestations” emerging from the human/ environmental mutual field process. The fourth constituent is that the nurse uses pandimensional modes of awareness when appreciating pattern information. In other words, intuition, tacit knowing, and other forms of awareness beyond the five senses are ways of apprehending manifestations of pattern. Fifth, all pattern information has meaning only when conceptualized and interpreted within a unitary context. Synopsis and synthesis are requisites to unitary knowing. Synopsis is a process of deliberately viewing together all aspects of a human experience (Cowling, 1997). Interpreting pattern information within a unitary perspective means that all phenomena and events are related nonlinearly. Also, phenomena and events are not discrete or separate but rather coevolve together in mutual process. Furthermore, all pattern information is a reflection of the human/environment mutual field process. The human and environmental fields are inseparable. Thus, any information from the client is also a reflection of his or her environment. Physiological and other reductionist measures have new meaning when interpreted within a unitary context. For example, a blood pressure interpreted within a unitary context means the blood pressure is a manifestation of pattern emerging from the entire human/environmental field mutual process rather than simply a physiological measure. Thus, any expression from the client is unitary and not particular by reflecting the unitary field from which it emanates (Cowling, 1993b). The sixth constituent in Cowling’s practice method describes the format for documenting and presenting pattern information. Rather than stating nursing diagnoses and reporting “assessment data” in a format that is particularistic and reductionistic by dividing the data into categories or parts, the nurse constructs a “pattern profile.” Usually the pattern profile is in the form of a narrative summarizing the client’s experiences, perceptions, and expression inferred from the pattern appreciation process. The pattern profile tells the story of the client’s situation and should be expressed in as many of the client’s own words as possible. Relevant particularistic data such as physiological data interpreted within a unitary context may be included in the pattern profile. Cowling (1990, 1993b) also identified additional forms of pattern profiles, including single words or phrases; and listing pattern information, diagrams, pictures, photographs, or metaphors that are meaningful in conveying the themes and essence of the pattern information. Seventh, the primary source for verifying pattern appreciation and profile is the client. Verifying can occur by sharing the pattern profile with the client for revision and confirmation. During verification, the nurse also discusses options, mutually identifies goals, and plans mutual patterning strategies. Sharing the pattern profile with the client enhances participation in the planning of care and facilitates the client’s knowing participation in the change process (Cowling, 1997). The eighth constituent identifies knowing participation in change as the foundation for health patterning. Knowing participation in change is being aware of what one is choosing to do, feeling free to do it, doing it intentionally, and being actively involved in the change process. The purpose of health patterning is to assist clients in knowing participation in change (Barrett, 1988). Ninth, pattern appreciation incorporates the concepts and principles of unitary science, and approaches for health patterning are determined by the client. Last, knowledge derived from pattern appreciation reflects the unique patterning of the client (Cowling, 1997). Praxeis is a Greek term used from Aristotle to Marxist philosophers of science to describe the integration of theory with practice. Bernstein (1999) explains that Marx viewed praxis is the “ultimate harmony of theory and practice —theoria and praxis— not in the sense that philosophy guides action, but rather in the sense that philosophy is the comprehension of what is (p. 34). In the broadest sense, praxis refers to practical human conduct that can be can be artistic, ethical, and scientific. Updated in 2018, originally published in Butcher, H.K. (2006). Unitary pattern-based praxis: A nexus of Rogerian cosmology, philosophy, and science. Visions: The Journal of Rogerian Nursing Science, 14(2), 8-33. Butcher (2006) explained that the idea of praxis is particularly congruent with the Science of Unitary Human Beings. Seng (1998), in her analysis of praxis, identified two “work” domains in the praxis conceptual framework: “theorizing” and “practicing” (p. 43). Like praxis, the harmony of theorizing and practicing is supported in Rogers (1970) statement that “the social ends for which nursing exists find fulfillment in the union of theory and practice” (p. 121). The unity of theorizing and practicing is also evident in Rogers (1992) consistent descriptions of nursing as “both a science and an art” (p. 28) and that the “practice of nursing encompasses the art of nursing” (Rogers, 1970, p. 121). The art of nursing “is the creative use of the science of nursing for human betterment” (Rogers, 1992, p. 28). Any model of Rogerian praxis, therefore, must be both “theorizing” and “practicing” and encompass actions that are artistic and aesthetic, ethical, philosophical, scientific, and practical. In an attempt to develop a more inclusive and comprehensive praxis model, Butcher (2001, 2006) synthesized Cowling’s (1990, 1997) Rogerian practice constituents with Barrett’s practice method (1990, 1998) and consists of two processes: pattern manifestation knowing-appreciation and voluntary mutual patterning. The two processes are continuous and nonlinear, therefore not necessarily sequential and are informed by the nexus of knowledge arising from the Rogerian cosmology, philosophy (ontology, epistemology, aesthetics, ethics), postulates, principles, and theories. Therefore, when using the unitary pattern-based praxis model, the following nexus of knowledge is fused with and integral to the pattern manifestation knowing-appreciation and voluntary mutual patterning praxis processes. 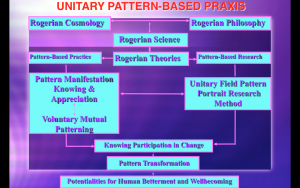 Note, the the beauty of the Unitary Praxis Model combines both a model for guiding practice with a model (the Unitary Field Pattern Portrait research method). The left side of the model (see Figure 7.1 described the process on the application of the model to practice. The right side of the model describes the processes of the application of the model to research which will be explained in detail in Chapter 8: Rogerian Research Methods. The remainder of this chapter will focus on the the practice side of the Unitary Praxis Model. The content of the section was originally published in an article Unitary pattern-based praxis: A nexus of Rogerian cosmology, philosophy, and science that was published in Visions: The Journal of Rogerian Nursing Science, 14(2), 8-33. Rogerian Cosmology, Philosophy, and Science provide the foundation practice grounded in the Science of Unitary Human Beings. Cosmology: A full awareness of the pandimensional nature of all reality and uses pandimensional modes of awareness. Ontology: Persons and their environments are understood to be irreducible energy fields engaged in mutual process with their environment characterized by pattern that is continuously evolving rhythmically and unpredictably toward increasing diversity and innovativeness. Epistemology: Pattern is the source of all knowledge and may be apprehended in the form of experiences, perceptions, and expressions. Aesthetics: Appreciation of the beauty of kaleidoscopic and symphonic pattern emerging from the human-environmental mutual field process. Ethics: Include all the ethical values (reverence, human betterment, generosity, commitment, diversity, responsibility, compassion, wisdom, justice-creating, openness, courage, optimism, humor, unity, transformation, and celebration) into all aspects of pattern manifestation knowing-appreciation and voluntary mutual patterning praxis processes. Science: Incorporate the meaning of Rogers’ postulates of energy fields, openness, pattern, pandimensionality and the principles of integrality, helicy, and resonancy in the conceptualization of all phenomena relevant to unitary in either patient care or research contexts. Theories: Selectively use appropriate theories derived from the Science of Unitary Human Beings to guide the pattern manifestation knowing-appreciation and voluntary mutual patterning processes. Pattern manifestation knowing-appreciation is the process of identifying and appreciating kaleidoscopic and symphonic manifestations of patterning emerging from the human/environmental field mutual process. The focus is on manifestations of patterning in the form of experiences, perceptions, and expressions (Butcher, 2006). Cowling’s (1997) description of the pattern appreciation process serves as an orientation and infuses all aspects of pattern manifestation knowing-appreciation. Knowing refers to apprehending pattern manifestations while appreciation seeks for a perception of the full force of pattern. During the process of pattern manifestation knowing-appreciation, the nurse and client are co-equal participants. Clients may be persons, families, and/or communities. The nurse creates an atmosphere of openness and freedom so clients can freely participate in the process of knowing participation in change. Approaching the nursing situation with an appreciation of the uniqueness of each person, unconditional love, empathy, and compassion can helps create an atmosphere of openness and a potential for healing. Data are not divided nor understood as unitary when separated into biological, psychological, social, spiritual, or cultural categories. Rather, a focus on experiences, perceptions, and expressions is a synthesis more and different than the sum of parts. Pattern manifestation knowing-appreciation, therefore, involves focusing on the experiences, perceptions, and expressions of a health situation revealed through a rhythmic flow of communion and dialogue. In most situations, the nurse can initially ask clients to describe their concerns about the health situation. The dialogue is guided toward focusing on uncovering the client’s experiences, perceptions, and expressions related to the health situation as a means to reach a deeper understanding of unitary field pattern. Cowling (1993) explains that human are constantly all-at-once experiencing, perceiving, and expressions. Experience involves the rawness of living through sensing and being aware as a source of knowledge and includes any item or ingredient the client senses (Cowling, 1997). The client’s observation and description of their health situation includes their experiences. “Perceiving is the apprehending of experience or the ability to reflect while experiencing” (Cowling, 1993, p. 202). Perception is making sense of the experience through awareness, apprehension, observation, and interpreting. Asking clients about their concerns, fears, observations is a way of apprehending their perceptions. Expressions are manifestations of experiences and perceptions, which reflect human field patterning. In addition, expressions are any form of information that comes forward in the encounter with the client. All expressions are energetic manifestations of field pattern. Body language, communication patterns, gait, behaviors, lab values, and vital signs are examples of energetic manifestations of human/environmental field patterning. Thus, all information about the client/environment/health situation is relevant, however, all information is interpreted within a unitary context. A unitary context refers to conceptualizing all information as energetic/dynamic manifestations of pattern emerging from a pandimensional human/environment mutual process. Thus, all information is understood as being interconnected, inseparable from environmental context, rhythmically unfolding in a nonlinear way, and is a reflection of the whole. Data are not divided or understood by dividing information into physical, psychological, social, spiritual, or cultural categories. Rather, a focus on experiences, perceptions, and expressions is a synthesis more and different than the sum of parts. The art in pattern manifestation knowing and appreciation is the art of grasping meaning, creating a meaningful connection, and participating knowingly in the client’s change process (Butcher, 1999). Grasping meaning entails using sensitivity, active listening, conveying unconditional acceptance, while remaining fully open to the rhythm, movement, intensity, and configuration of pattern manifestations. Pattern manifestation knowing and appreciation is approached with an orientation toward gratefulness, enjoyment, and understanding. The nurse is also open to using multiple forms of knowing including pandimensional modes of awareness (intuition, meditative insights, tacit knowing) throughout the pattern manifestation knowing and appreciation process. Intuition and tacit knowing are artful ways to enable seeing the whole, revealing subtle patterns, and deepening understanding. Through integrality, nurse and client are always connected in mutual process. However, a meaningful connection with the client is facilitated by creating a rhythm and flow through the intentional expression of unconditional love, compassion, and empathy (Butcher, 1993). The integrality of the nurse and client is also enhanced by creating a sense of communion by intentionally focusing on and immersing in the rhythmical flow of expressions, perceptions, and experiences. Together, in mutual process, the nurse and client explore the meanings, images, symbols, metaphors, thoughts, insights, intuitions, memories, hopes, apprehensions, feelings, and dreams associated with the health situation. A unitary perspective in nursing practice leads to a focus on new kinds of information that may not be considered within other theoretical approaches to nursing practice. For example, pattern information concerning time perception, sense of rhythm or movement, sense of connectedness with the environment, ideas of one’s own personal myth, and sense of integrity are relevant indicators of human/environment/health potentialities. A person’s hopes and dreams, communication patterns, sleep-rest rhythms, comfort-discomfort, waking-beyond waking experiences, and degree of knowing participation in change provide important information regarding one’s thoughts and feelings concerning a health situation. In a patient care context, the nurse can also use a number of tools derived from Rogers’ postulates and principles to enhance the collecting and understanding of relevant information specific to Rogerian Science. Barrett (1989) developed the power as knowing participation in change tool as a way of knowing clients’ energy field patterns in relation to their capacity to knowing participate in the continuous patterning of human and environmental fields as manifest in frequencies of awareness, choice making ability, sense of freedom to act intentionally, and degree of involvement in creating change. Watson’s (1993) assessment of dream experience scale can be used to know and appreciate the clients’ dream experiences, and Ference’s (1979) human field motion tool is an indicator of the wave frequency pattern of the energy field. Hastings-Tolsma’s (1992) diversity of human field pattern scale may be used as a means for knowing and appreciating a clients’ perception of the diversity of their energy field pattern, Johnston’s (1994) human image metaphor scale can be used as a way of knowing and appreciating the clients’ perception of the wholeness of their energy field, and Gueldner et al.’s (2005) well-being picture scale affords a way to measure a person’s sense of unitary well-being. Paletta (1990) developed a tool consistent with Rogerian Science that measures the subjective awareness of temporal experience temporal. Leddy’s (1995) person-environment participation scale may be used to know and appreciate expansiveness and ease of a person’s participation in the human/environment/health process. Disturbances are energy field patterning may manifest as a low score in either power, human field motion, diversity of pattern or human field image. The nurse’s ability to participate knowingly in the client’s change process is further enhanced by having a deep understanding and appreciation of the wholeness and essence of the client’s human-environment experience. When the nurse has apprehended enough pattern information from the pattern manifestation knowing and appreciation process, a pattern profile may be constructed. Just as art expresses the essence of the human condition (Govignon, 1998), the pattern profile is a expression of the essence the person-environment-health situation. The nurse/artist weaves together the expressions, perceptions, and experiences in a way that tells the client’s story. The pattern profile, like a work of art, reveals the hidden meaning embedded in the client’s human-environmental mutual field process. Once the construction of the pattern profile is complete, the nurse shares the profile with the client. The two process of pattern manifestation knowing and appreciation and voluntary mutual patterning are continuous and not sequential. Voluntary mutual patterning is a process of transforming human/environmental field patterning. Barrett (1998) explains that the term “voluntary” implies having freedom of choice, spontaneity, and willful intention of one’s choices and actions. It is important that the nurse in a unitary pattern-based practice allow clients the freedom to choose their own health patterning strategies. The goal of voluntary mutual patterning is to facilitate the client’s ability to participate knowingly in change, harmonize person/environment integrality, and promote healing potentialities, life style changes, and well being in the client’s desired direction of change or attachment to predetermined outcomes (Butcher, 2006). The nurse does not invest in changing the client in a particular direction but rather facilitates and mutually explores with the client options and choices, provides information and resources, so the client can make informed decisions regarded their health and well being. Thus, clients feel free to choose with awareness how they want to participate in their own change process. Options are explored, and the nurse may explore potentialities or possibilities that may result from different choices. The nurse also provides information and knowledge so that clients can make informed decisions and participate knowingly in their own change process. Control and predictability are not consistent with Rogers’ postulate of pandimensionality and principles of integrality and helicy. Rather, acausality allows for freedom of choice meaning that outcomes are unpredictable. The goal of voluntary mutual patterning is the actualization of potentialities for well being through knowing participation in change. The process is mutual in that both the nurse and the clients are changed with each encounter, each patterning one another and co-evolving together. Although patterning is continuous, voluntary mutual patterning is often associated with sharing the pattern profile with the client. Sharing the pattern profile with the client is a means of verifying the interpretation of pattern information and may ignite further dialogue revealing new and more in-depth information. Sharing the pattern profile with a client also facilitates pattern recognition potentially enhancing his/her knowing participation in their change process. An increased awareness of one’s own pattern may offer new insight and increase one’s desire to participate in the change process. In addition, the nurse and client can continue to mutually explore goals, options, choices, and voluntary mutual patterning strategies as a means to facilitate a clients’ actualization of their human/environmental field potentials. In addition, many “interventions” identified in the Nursing Intervention (NIC) Classification (Butcher, Bulechek, Dochtermann, Wagner, 2018) may be used as mutual patterning strategies. Of the 565 interventions in the NIC classification system, many of the noninvasive “interventions” such as therapeutic touch, simple guided imagery, journaling, simple massage, and aromatherapy are already congruent with a unitary perspective. However, most of the other interventions can be reconceptualized within a unitary perspective as voluntary mutual patterning strategies. Sharing knowledge through health education, providing health education literature, and teaching also have the potential to enhance knowing participation in change. NOC (Nursing Outcomes Classification) (Moorhead, Swanson, Johnson, & Maas, 2018) may also be used, but are reconceptualized, not as outcomes, but each outcome is understood as acausal potential for change. The indicators then become ways to see pattern changes over time. Sharing the pattern profile with the client facilitates pattern recognition. An increased awareness and insight into one’s own patterns provides insight which powers knowing participation in change and potentates transformation of human-environmental field patterning. While sharing the pattern profile with the client, the nurse discusses options, mutually identify goals, explore the meaning of the pattern profile, and plan voluntary mutual patterning strategies. Knowingly participating in the client’s change process is guided by knowledge generated from the translation of postulates and principles in Rogerian Science to practice situation. For example, theories derived from Rogers’ postulates and principles such as the theory of power as knowing participation in change (Barrett, 1989); the theory of perceived dissonance (Bultemeier, 1997); the theory of kaleidoscoping in life’s turbulence (Butcher, 1993); the theory of enfolding health-as-wholeness-harmony (Carboni, 1995), and the Personalized Nursing LIGHT practice model (Anderson & Smereck, 1989; Anderson & Smereck, 1994) all enhance the nurse’s ability to participate knowingly in change. There is a wide range of non-invasive human-environmental field patterning strategies with the potential to facilitate human betterment, well-being, and harmony. Artfully performing unitary patterning strategies is the heart of voluntary mutual patterning. Artfulness is compassionate skillfulness. Unitary patterning modalities are the creative and imaginative use of knowledge for the purpose of enhancing knowing participation in change, harmonizing person/environment integrality, and promoting healing potentialities and well-being. Artistry in Rogerian Art emerges from the art/act of using non-invasive patterning modalities in unitary pattern-based practice. A wide variety of mutual patterning strategies may be used in unitary pattern-based praxis. It is important to point out that Rogers placed great emphasis on what is traditionally viewed as holistic noninvasive modalities. In particular, Therapeutic Touch (Malinski, 1994, Meehan, 1990), Reiki (Ring, 2006), story-telling (Madrid, 1994), written expression (Butcher, 2004), guided imagery (Butcher & Parker, 1988), using selected literature designed to enhance well-being, unitary landscape narratives (Butcher, 2005a); humor, sound, dialogue, affirmations, music, massage, journaling, language, story-telling, and journaling. exercise, relaxation therapy, nutrition, reminiscence, magnetic fields, herbs, aroma, light, color, art work, healing art images, meditation, mindfulness meditation, Transcendental Meditation, yoga, poetry, movement, Tai Chi, and dance are just a few of the voluntary mutually patterning strategies consistent with a unitary perspective. Lastly, unitary pattern-based practice includes the nurse’s ability to use Rogerian-ethics in practice. In an ethical analysis of Rogers’ life and work, Butcher (1999) uncovered a constellation values integral to Rogers’ Science of Unitary Human Beings. Artful unitary pattern-based practice is inspired by Rogerian ideals including: reverence, human betterment, generosity, commitment, diversity, responsibility, compassion, wisdom, justice-creating, openness, courage, optimism, humor, unity, transformation, and celebration. Of special consideration is the idea that Rogerian ethics places emphasis on justice-creating. Therefore, with patterns that are experienced as oppressive, the nurse, in mutual process with persons, groups, and/or communities, works to mutually design patterning strategies designed to facilitate awareness, choices, freedom to act, and involvement in changing the human-environmental field patterns experienced as oppressive. Inequalities, prejudice, social injustice, and abuses of power can serve to limit the ability of all persons and communities in achieving their potentials for health and well-being. Only by mutually participating in changing human-environmental field patterns experienced as oppressing health potentials will nurses be able to fully facilitate the potentialities for wellbecoming and human betterment for all. Evaluation is continuous and integral to both pattern manifestation knowing-appreciation and voluntary mutual patterning. The nurse is continuously evaluating changes in patterning emerging from the human/environmental field mutual process. Regardless of which one or more of voluntary patterning strategies are used, the intention is for persons to actualize their potentials related to human wellbecoming and betterment. Butcher, H.K. (in press). Imbalanced Energy Field: Development, Conceptualization and Practice within Rogerian Nursing Science. PRONANDA: Programa de Atualização em Diagnósticos de Enfermagem. In: T.Heather Herdman; organizadoras-geral, Anamaria Alves Napoleao, Camila Takao, Viviana Marlins (organizadoras). Artmed Panamerica: Porto Alegre, Brazil. Together, JP and the nurse went over each of the selected patterning modalities and discussed the selected activities for each NIC. They agreed to set up regular routine weekly one-hour sessions and the hospital outpatient clinic for counseling and to monitor JP’s participation in his change process. In each session, the nurse would engage in patient teaching, monitoring, and evaluate NOC indicators for change in each of the selected NOC potentials for change while the other members of the transplant team focused or treating his medical condition in preparation for heart transplant surgery.